In an important development, the municipal corporation (MC) is all set to take charge of primary healthcare and primary education in the union territory, which are currently under the charge of the Chandigarh administration. The MC will shortly take over the charge of 18 sanctioned, three unsanctioned dispensaries and seven government primary schools. The MC will also take over all but three gardens. The details of transfer of powers are being chalked out in separate meetings being chaired by the UT Adviser, Pradeep Mehra, and the UT Home Secretary, Ram Niwas. A formal notification is expected shortly. The MC Act has underlined primary healthcare and education and maintenance of internal roads and parks as functions of the elected body. The UT had not handed over the role in healthcare and education till date. The transferred dispensaries will include those at Sectors 8, 11, 19, 20, 23, 26, 33, 35, 38, 40 and 42, Punjab and Haryana High Court, Punjab Civil Secretariat, Industrial Area, Kajheri, Maloya, Hallo Majra and Dadu Majra. The unsanctioned dispensaries that will be transferred are the ones located at Mani Majra’s Modern Housing Complex and Sectors 9 and 17. The MC is also likely to take over polyclinics at Sector 49, Ayush Hospital and Maloya’s Maternity Hospital. The primary schools that will be transferred to the MC include those located at Butrela, Sectors 12 and 26, Mauli Complex, Railway Colony and two at Mani Majra. The MC will be responsible for all green belts in the city, which include more than 125 parks in the city. The UT administration will continue to take care of the Bougainvillea Garden, Sector 3, the Leisure Valley, Sector 10, and the Rose Garden, Sector 16. 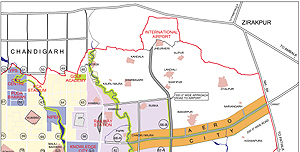 Two important green belts, earlier under the care of the UT administration, to be transferred to the MC include the Rajindra Park, Sector 1, and the Bamboo Valley, Sector 23. The MC will also be responsible for the government nursery at Sector 23. There are 1,600 small parks, 43 green belts and 40 big gardens in the city. The UT will have to work out clear norms on deployment in the changed set-up. In case of health centres, a majority of the staff is on deputation from Punjab and Haryana, who will have return. In case of teachers, it has been pointed out that it will be not possible to transfer the staff of the UT administration to the MC due to the staff crunch and legal complications. It’s raining moolah for farmers in the city’s periphery. And the cash is not flowing in from the huge Rs 1.50 crore an acre compensation paid by the Punjab government for land acquired for the Aerocity project, but from “deals” struck by enterprising farmers who have sold out residential and commercial plots earmarked for them under the land pooling scheme. Owners of approximately 150 acres of land (out of the total of 771 acres acquired for Aerocity), who have opted for this scheme, have been guaranteed a residential plot of 930 square yards and a 121 square yard commercial plot for every acre of land acquired. About 500 such plots of different sizes are to be allotted after a period of one year. To make a quick buck, some of the beneficiaries in Bakarpur, Kishanpura, Matran, Chachu Majra, Naraingarh, Chatt and Manauli villages have begun selling plots by accepting a premium. “The landowners are either bifurcating residential plots or selling commercial plots after entering into agreements with buyers. Property dealers are mostly buying plots at their risk”, confided a landowner. While the Greater Mohali Area Development Authority (GMADA) will hold the draw of lots for plots in Aerocity by September, the farmers have already sold the plots yet to be allotted to them. However GMADA officials say bifurcation of plots is not allowed and they can be sold only after being allotted. In addition to selling the plots, the beneficiaries under the land pooling scheme will also get an annual rent of around Rs 25,000 an acre for two years until the time they are handed physical possession of the plots. It is not that the farmers are the only beneficiaries. Knowing well that a whopping Rs 1,000 crore has been paid for acquiring the land, GMADA is tapping the landowners as potential investors in Aerocity. A senior GMADA official said, “We have allowed bank branches in rural areas to sell the application forms. Landowners are expected to apply in bulk”. Within 17 days of floating the Aerocity project, about 250,000 application forms have been sold through various banks. GMADA officials expect the figure to touch 300,000 by the time the scheme closes on July 6. Seeing the huge interest among prospective investors, banks have begun lowering interest rates on the earnest money amount. After State Bank of India lowered its rate from 8.25 to 7.5 per cent, Oriental Bank of Commerce today announced an interest rate of 7.4 per cent for earnest money. The Punjab State Cooperative Bank is also believed to be planning to reduce its interest rate. Raped by her biological father, when she was a minor, Raadhika (name changed) has left the black days of trauma behind and has emerged as an achiever. The tormenting incident had shaken this 16-year-old girl. Three years after her father was booked, by the local police, today she is completely transformed. The traumatised girl who would not even speak today is a picture of complete poise. A true fighter, Raadhika (name changed), has recovered from the fact that her father, Gajjan Singh, was her tormentor. He raped her since she was in Class V and physically abused her till she was in grade VII in July 2007. From misery to joy, Raadhika lives a life like any other teenager. She paints, she participates in dance competitions, she is all set to prepare for Class X board examinations and aspires to become a teacher. It may be remembered that when orders in the case were pronounced in September 2008, she had stated that she wanted death sentence for her father. She had been communicating to the counselors who used to visit her at Nari Niketan since 2007 through paintings. Sketches and colours became her voice to the extent that when the orders in her case were pronounced in September 2008, she expressed her eagerness to be with her family. She made a sketch titled - “Going Back Home”. However, a changed Raadhika no longer speaks through paintings. She uses her voice. Panting is her passion now. She has recently won first prize in painting competition and proudly showcases her trophy in her room in Snehlaya. Raadhika disclosed this in a meeting of the child welfare committee in the office here. While overcoming probably the toughest phase of her life, Raadhika found it difficult to cope up with the trauma and failed in Class VII. She is all set to become a teacher in near future. “I enjoy looking after children, which has inspired me to take up teaching,” said a confident Raadhika. Presently she is burning the midnight oil to appear in Class X exams and plans to study up to graduation level. In this new phase, Raadhika is a busy taking dance class at Snehalaya for a performance at the Tagore Theatre. Well informed about her rights she was also, concerned about the compensation of Rs 1 lakh that the court had provided her with while pronouncing the orders. Raadhika said she wanted to know in which bank the money and what the procedure to inquire about it was. The half-hour storm yesterday exposed the ill-preparedness of the UT’s Electricity Department to tackle such situations, with parts of the city plunging into darkness last night. The pre-monsoon showers, preceded by a dust storm and gusty winds, threw life out of gear in the city, disrupting power supply last night. Interestingly, this time, not only southern sectors, but northern sectors of the city, including Sectors 8, 11 and 15, had to bear the brunt. The authorities claimed that the dust storm led to extensive damage to electricity wires, resulting in snapping of power supply for hours last night. Residents of Sector 11 had to face the brunt immediately after the storm ended around 4 pm, with power supply disrupted all evening. “Repeated calls on the lone complaint number fetched no result as the telephone was placed off the hook. We could not sleep last night,” said Rakesh Bajaj of Sector 11. The situation was no better at Sector 8, where power supply went off around 5 pm and could be restored only at 11 pm. Residents of Sector 27 were in a similar situation, with no power supply till the wee hours. Power supply to Type 12 and 13 houses at the PGI, disrupted around 2 pm yesterday, was not restored till 6 pm today. Residents of Sector 55, who had been reeling under constant voltage fluctuation for the last four days, were the worst hit, with no power supply all night. It was restored this morning. Residents of Sectors 42, 44 and 45 were equally harassed due to power disruption for more than four hours last night. Meanwhile, residents of Sectors 9, 10, 11, 15 and 16, Punjab Engineering College at Sector 12, Modern Housing Complex at Mani Majra and Khuda Ali Sher village faced considerable discomfort, with unscheduled power cuts throughout the day today. The authorities maintained that the disruption today was due to some fault in wires and the repair work was already on in most of these sectors. Residents in some parts of the city had to remain without power here last night. The power went off in various sectors, including Sectors 4, 6, 7, 8, 9, 10, 17, and 20. The residents claimed that though the power supply was restored in the morning, but it remained inconsistent throughout the day. It may be mentioned here that the residents of Sector 15 and its adjoining areas raised slogans against the electricity department and the district administration for not restoring the power supply in their areas at midnight. Executive engineer PK Goel said the department was trying to repair the lines damaged due to the hailstorm accompanied by heavy rains that lashed the region. He said four transformers of 220 kV and four polls were damaged. He added that power supply had been restored in 95 per cent area of the city. Efforts were on to restore the power supply to the remaining areas, he further added. Sunil Kumar, a resident of Sector 17, said it was very difficult to bear the sweltering heat and the power cut had added to their woes. He said even the inverters had stopped working as there was not enough power to charge the battery. Ashutosh, a resident of Sector 4, said even though the power supply resumed after 23 hours, some houses (from house numbers 1582 to 89 and 1734 to 1755) were not getting the power supply. He said the complaints cell of the department was not responding to the calls made by the residents. Preparations for launching a postal stamp on Friday when the Queen’s Baton Relay of the Commonwealth Games will enter India from Pakistan through the Attari border, has left officials of the Postal Department perspiring. Though merely a day is left to the programme to be attended by Union Minister of State for Communications Gurudas Kamath, the directorate could not finalise the mode of releasing the stamp as there was no coordination among the agencies involved. 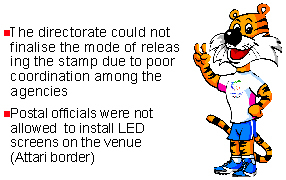 Though Nirmaljit Singh, director Postal Services, Punjab, denied any such problem, sources said the postal officials had found them in a quandary when they were not allowed to install the LED screens on the venue. In fact, the directorate of the Postal Department from New Delhi had directed the officials at headquarters of Punjab Circle at Chandigarh that arrangements be made to install the LED screens on the venue. Usually, a blown out of the stamp is put up on a veiled panel and the minister switches on a button to activate the electronic curtain that lifts unveiling the stamp. A team of postal officials was today dispatched to Attari border for installing the screens, but the security men did not allow them to do so. The directorate officials were then informed about the problem, who further asked their Chandigarh counterparts to contact event managers who were still on their way to Attari. They said they could take decide once they reached the venue. Finding no way to come out of the situation, the officials have now decided to make all possible arrangements. While an official is sent to New Delhi to arrange the unveiling machine and learn its functioning, orders were being placed to prepare an album that would carry the stamp and in case both options were rejected, the authorities are ready to put up blown outs of stamps on the venue. Is the city really prepared for monsoon, which is expected to reach the region by the first week of next month? The pre-monsoon showers recently, little rain with thunder, exposed the preparedness of the Chandigarh municipal corporation, which claimed to have made all arrangements a month prior the arrival of monsoon. The corporation had constituted seven teams last month to ensure cleaning of road gullies on different roads of sectors, villages and colonies before the rains set in. The team leaders were also instructed to inform the area councilors concerned regarding repair work and cleanliness of road gullies. Directions were also issued to officers to repair damaged road gullies and take all possible steps to prevent rainwater from accumulating in sectors, colonies and villages. Even after the special operation conducted by the MC’s engineering department, complaints of waterlogging on various roads during the recent pre-monsoon showers flooded in. During a visit to various sectors, including 17, 22, 26, 35, 38 and 40, and majority of colonies and villages, it was found that after cleaning the road gullies, garbage was dumped on road berms. Consequently, during rain most of the garbage flowed back into the gullies and blocked them, leading to waterlogging. Even the repair work of gullies had not been completed by the team. Dadu Majra councillor Kamlesh said every year assurance was given by officials that they would clean up the drainage system before monsoon set in but each time rain exposed the seriousness of the authorities in get their instructions fully implemented. Similarly, Ram Darbar councillor Ram Lal lamented that the corporation had not constructed road gullies for the recently carpeted roads in their area due to which water had accumulated on the roadside, thus damaging the roads. Meanwhile, the city witnessed traffic jams today as trees that had fallen during the yesterday’s storm blocked several roads. It took authorities quite some time to remove the trees. At several places, parked vehicles and houses were damaged after the trees fell on these. The boundary wall of DAV School, Sector 8, also collapsed. At the Le Corbusier Centre, Sector 19, an uprooted tree damaged the roof of the exhibition hall. A tree that fell due to the storm damaged the boundary wall of the Arts College, Sector 10. Most of the services were restored by afternoon in almost all parts of the city and the adjoining areas. However, the Chandigarh railway station bore the brunt of yesterday’s storm with a part of the recently installed fibre roof blowing away. It fell on the railway tracks at platform No. 1, disrupting the rail traffic for over half an hour. According to railway sources, Himalayan Queen, which was to leave the city at 5.30 pm, departed at 6.10 pm, late by 40 minutes. The fibre roof had recently been installed at a cost of Rs 40 lakh. According to railway sources, the loss was estimated at several lakhs. An inquiry is likely to be marked to see if there was any laxity in designing the structure of the roof. The personnel department of the Chandigarh administration has turned down the proposal of the Government Medical College and Hospital (GMCH), Sector 32, authorities to re-employ the former head of the anatomy department, Dr Balbir Singh, who retired on April 30. The attempt of the GMCH authorities to facilitate Dr Singh’s return was highlighted in a report in these columns on May 20. To strengthen Dr Singh’s case for re-employment, the GMCH authorities, besides claiming that there was no professor in the department, had stated that there were similar cases of re-employment in the Punjab government. The hospital authorities were hopeful that Dr Singh’s case would be cleared since the administration was following the Punjab Service Rules. However, the UT personnel department did not accept the contention and turned down the proposal on the grounds that they followed the Punjab rules only for service conditions and not otherwise. Sources in the health department said the personnel department had said that “re-employment is not a condition of service”. As for the Punjab Service Rules, the UT administration only followed the conditions of services. In their bid to get Dr Singh on the board, the GMCH authorities had conveniently attempted to take advantage of certain technicalities and project that there was no professor in the department besides Dr Singh and hence his re-employment was necessary. However, Dr Kanchan Kapoor had been working in GMCH’s anatomy department as professor since her promotion to the post in November 1, 2006. She had been a reader in the department since January 1, 2003. However, she was working as a “re-designated” professor as the formalities of the post getting cleared from the UPSC were still pending. Interestingly, even after Dr Singh’s retirement, the anatomy department had one professor (Dr Kapoor), one reader/associate professor (Dr Mahesh Kumar Sharma) and two assistant professors (Dr Avinesh Abhay and Dr Anshu Sharma), which, according to the Medical Council of India (MCI) norms, was sufficient for a department with a strength of 50 students. Two faculty members — professor and head of the community medicine and dental departments, respectively — were working as “re-designated” professors. Even the MCI had voiced no objections on the issue of “re-designated” professors during its inspection last year. At that time, Dr Sudheer (orthopaedics), Dr BR Sharma (forensic medicine), Dr GP Thami (dermatology), Dr Savita Basu (blood transfusion) and Dr Satinder Gomber (anesthesia) were working as “re-designated” professors. Spiritual sanctity pervaded the Tagore Theatre as devout audience savoured a slice of the life history and teachings of spiritual saint Shri Shirdi Sai Baba in a light, sound and drama spectacle here today. Weaved in a mythological mould, the production veritably titled “Kar lo dukhon ka ant hey mere Sai” presented under the aegis of Shirdi Sai Arpan Cultural Society, Chandigarh, kept the audience in rapt attention. Scripted by Surinder Saini and directed by Vineet Sharma, it touched 13 episodes from the life of Baba, which reflected the spiritual wisdom and abundant love for ethical values, humanity and social equality of the great saint. The show promoted by Satish Berry, casting 54 artistes, depicted many sequences of how visionary Baba transformed the evil-minded persons to ideal human beings. The background music by Tarsem Walia with playback by Pammi Hanspal, Bobby, Neelam Nautial, Vishal Sharma and others lent credence to the production. Dominating recorded narratives and music did not leave much scope for acting spells, but female artistes like Madhu Bala, Sunny and Aneesh Sharma displayed better emotional expressions. Jatinder Sharma portraying Baba was convincing, as also Shanti Saini Mukesh Sharma and Hardik playing the Baba as child. Earlier chief guest Shivraj Patil, Governor, Punjab, inaugurated the show by lighting the traditional lamp. Visitors faced parking problems as only a few flagged cars were permitted to enter the theatre. Piqued over the indifferent attitude of the district administration, residents of Sector 15 blocked a road near the Amartex chowk here today. The protesting residents placed big cement pipes, meant for storm water drainage, on the road besides placing bricks and stones. The traffic was disrupted for about one hour. The officials of the district administration and the police reached the spot and tried to pacify the agitating residents. However, the residents demanded that unless the administration started to clear the water-logging they would not move from the area. The roadblock was only lifted after Satish Singla, tehsildar, immediately called the fire brigade to throw out the water from the street. The labourers were also deployed to level the road. Residents alleged that despite several representations the district administration has not taken any step to level the entire stretch of around one kilometre from house number 1026 to 1054. They said the stretch, which had been blocked with old sewage pipes that have been lying there for the past six years, was nothing but an uneven patch of mud and sewage. An examination scheduled by the district administration for the selection of stamp vendors was ‘cancelled’ at the last minute causing harassment to all those who had come to appear in it from far off places in the scorching heat. The examination was to be held in Shivalik Public School, Phase VI, at 10.30 am today. Candidates, who had come from areas like Kharar, Majri and Dera Bassi, apart from the town itself, were shocked to know that the examination was not being conducted for reasons unknown. A notice from the HRC, dated June 23, was pasted outside the gate of the school stating that the examination for stamp vendors was ‘cancelled’. Krishan Garg of Zirakpur, said he had applied for the job of a stamp vendor after the district authorities had given advertisements in this regard. Letters were sent by the authorities concerned to the applicants in which the date, time and place of the examination were mentioned and these were received yesterday by a number of applicants. He said no such examination was earlier held for the selection of stamp vendors. It is learnt that a number of applicants later visited the district administrative complex to find out the reason why the examination was cancelled, but had to return disappointed as the official in charge was not available and other employees were not aware of any such development. Harminder Singh Cheema, head registration clerk, however, told The Tribune that the examination for stamp vendors had not been cancelled but postponed. When asked why a cancellation notice had been pasted outside Shivalik School if the examination was postponed, he said it was a mistake committed by the public relations department. He said the examination could not be conducted due to some official problems. As many as 275 candidates were to appear in the examination. High drama prevailed outside the house of ward number 1 municipal councillor over distribution of water here late last night. More than 30 residents of Anand Vihar from ward number 13 raised slogans against the councillor and her husband for not giving them keys of a tubewell set up at Ramlila ground, Baltana. The councillor, Manisha Malik, alleged that she was manhandled by a group of residents and submitted her complaint to the police. On the other hand, the residents complained to the police that the councillor, her husband, and some other residents, misbehaved with them when they asked for the keys. In her complaint to the police, Manisha Malik stated that the incident occurred around 11.30 pm when she was sleeping at her house where around 30 persons knocked at her door and asked her to come out. Manisha alleged that when she opened the door, the mob started abusing and manhandled her. She further alleged that some of them had sticks and sharp-edged weapons. She informed the police about the incident. However, before the police could reach the spot the mob managed to flee from the area, she said. She further said that their approach was also not appropriate as she was not the councillor of their area. Residents of Anand Vihar, however, alleged that Subhash Malik, husband of the councillor, had forcibly started the supply water to his ward from the tubewell and took the keys of the tubewell from the operator. They alleged that Subhash misbehaved with them when they asked for the tubewell keys. Baltana Chowki in charge, ASI Gurwant Singh, stated that he got the complaints from both the parties against each other. A case would be registered after proper investigations, he said. When asked about the keys of the tubewell taken by the councillor’s husband, SDO, Punjab sewerage and water supply, Mahesh Chawla stated that the matter was not in his knowledge. “I will ask the operator and another official concerned about the issue,” he said. Dr Rajiv Vadera took over the temporary charge of the new medical superintendent of Government Multi Specialty Hospital, Sector 16, yesterday following the repatriation of Dr NK Arora to his parent state, Haryana. Dr Arora, who has been promoted, will take over as director rehabilitation (SAKET). Speculations have been rife about Dr Arora’s successor ever since his repatriation was announced. With the post exclusively set aside for doctors from Haryana cadre, the race is on for the plum post. The UT administration has received a panel of three doctors from the state but the name of the new medical superintendent has so far not been finalised. Health officials say a decision is expected within a fortnight or so. Those, who are in the race, include Dr Rajiv Vadera, who is with the medicine department of GMSH-16, Dr Praveen Garg (CMO) in Haryana and Dr Raminder (Civil Surgeon) in Faridabad. In a bid to improve basic policing, the SHO of the Industrial Area police station has given bicycles to beat staff for patrolling in their respective areas. SHO Dilsher Singh Chandel said the step was taken following the directions of senior officers to improve basic policing by intensifying patrolling. Two “separate” marksheets for the subject of drawing and painting of certain Class XII students of the Punjab School Education Board has adversely affected their chances of admission to higher classes. While one of the marksheets has shown the students having failed in the examination, the second one has shown them having scored between 74 and 93 per cent marks. According to information available, 12 students of Paragon Senior Secondary School, Sector 69, had appeared in the drawing and painting examination of Class XII on April 4 . As per the board results, all of them had failed in the subject. A relative of one of the students, Jaswinder Singh, said her niece, Monika Gogna, had appeared in the examination and was given only 22 marks in drawing and painting even when her “actual” score in the subject was 86. He claimed that an awards list had reached the board office from somewhere which had shown all students having failed in the subject each getting between 22 to 25 marks. But another awards list was showing the students having scored between 74 and 93 marks each. He said that not only students seeking admission to fine arts college were facing problems, the low score had hit the overall performance of students as well. The matter was of grave concern as admissions were on these days and students should not be made to suffer for an error allegedly committed by the board. Dr Dalbir Singh Dhillon, chairman of the board, said the examiner concerned had earlier given marks out of 50 and later sent another list giving the students marks out of 100. The matter was being verified. He alleged that employees of the board tried to play up certain shortcomings found in the results, as they were against the bar code system as they could no longer have any manual access to the results. Chandigarh: MET-2010 results have been declared. The results are available on the UIAMS website www.uiams.puchd.ac.in as well as on the UIAMS notice board. According to PK Sharma, chief coordinator, UIAMS, counselling letters have been dispatched. The counselling is scheduled for June 28 and 30, 2010, at UIAMS from 9 am onwards. Panjab University has invited applications for admission to two-year MA course (semester system) in community education and development offered by the department of community education and disability studies. The course aims at enabling the students to understand the issues pertaining to community development and its various perspectives at the global as well as at the national level. The course will provide an opportunity to students to work in collaboration with public, private, social and corporate sectors. Students with graduation degrees in any discipline with 50 per cent marks (45 per cent in case of SC/ST) are eligible to apply for admission in this course for the session (2010-11) with 25 seats. Last date is July 1, 2010. Forms for admission to BEd one-year (special education with specialisation in learning disabilities) for the session 2010-11 have been invited. Students with graduation degrees in any discipline with 50 per cent marks (45 per cent marks for SC/ST) are eligible to apply for admission to this course. Last date July 1. Panjab University’s re-evaluation branch has received an unprecedented number of requests for re-evaluation of answer sheets this year. The situation is worse in the case of all subjects of BCA (I) and BA LLB integrated course (all semesters, particularly first and 10th semester). Among the subjects in particular, the request for re-evaluating mathematics answer sheets is the maximum this time. The number of applications received by the department for the first year of BCA has already crossed the 1,000 mark and officials claim that the number will be much higher this year. This excludes the number of applications for the compartment examinations. In 2009, the total number of applications received by the re-evaluation branch for the same course was 900. One of the reasons cited for more number of re-evaluation requests this year has been the poor result of these courses in the affiliated colleges. Only 33.85 per cent students, who had appeared in the first year exam of BCA in April 2010, had managed to pass. Out of 3,882 students, who had appeared in the BCA-I examination this year, 1,506 failed, while 1,055 got compartment. In 2009, the overall pass percentage for BCA (I) was 36.65 per cent. A dire staff crunch in this branch has added to the woes of the employees, who are spotted working even during lunch hours and working extra hours each day. While the university authorities are committing to deliver timely results, much improvement is pending with regard to the staff and infrastructure in his branch. Regarding the dearth of staff in the branch, sources said most of the employees got promoted and transferred from the branch leading to a shortage. Controller of Examination, AK Bhandari, could not be reached for his comments. With parents enquiring about the re-evaluation process instead of queries related to admissions at the help desks set up on the Panjab University campus, members of various student organisations are facing a peculiar situation. These help desks aim at providing assistance to new students. “We have received over 400 queries so far. Ironically, students are more interested to know about the re-evaluation process and have examination-related queries,” said Harshvardhan Jhinja, presidential candidate, SOPU. Among queries related to admission, the first question asked by students is related to the fee structure, followed by queries on deadline for particular courses and the number of seats offered in the respective courses. “Students are more anxious to know about the fee structure for various courses. We are providing forms free of cost to students and the handbook, which costs Rs 500, is available at the helpdesks. Students can clarify their points from the handbook available at the counter,” said Harshvardhan.